Tarp Zipper is the perfect compliment to a PolyGrabber installation. 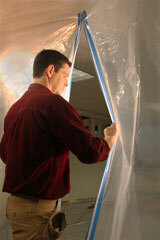 The Tarp Zipper is the right tool to use when you need to create a entrance or an exit in your dust barrier. Specially formulated to stick to all kinds of poly sheeting plastic. One 7' Tarp Zipper per box, use two zippers to create any size opening that you need. Congratulations, you've created an instant door!